The region's layered soils, which contribute to Aglianico's character, include a mix of lava and ash from long-dormant Mt. Vulture. The deep south of Italy's sleepy Basilicata region is not a place you'd expect to find a young, hip wine scene. Here, about 100 miles inland from Naples, in the hill country around the hulking, long-dormant volcano Mt. Vulture ("Voul-tour-ay"), you can drive miles without seeing a sign of modern life—other than the wind farms that top hills covered with grain fields, olive groves and vineyards for the powerful local red, Aglianico del Vulture. The area's population has been declining for decades. In many towns at midday, sometimes the only detectable life is a roaming cat or a lounging canine. Yet in recent years, a new generation of producers has come together, determined to improve the quality of Vulture wines and put its volcanic terroirs on the world wine map. Since early 2016, a group of producers in their mid-twenties to forties, representing eight wineries, has banded together informally as Generazione Vulture. "Everyone has their own ideas, their own vineyards and projects, and our wines are all very different," says the group's creator, winemaker Elena Fucci, 37, a Barile native who started her eponymous winery in 2000 from her family's vineyards. "But it's important for the new generation to be together to explain the different terroirs of Vulture." Elena Fucci makes a single cuvée, called Titolo, at her family winery. "Alone you don't get anywhere," adds charismatic Michele Bisceglia, 31, of Bisceglia Vini, founded in 2001 in Lavello. That sentiment was echoed by Carolin Martino, 36, of Armando Martino in Rionero in Vulture; although Vulture already has a traditional consortium of producers, with more than 30 members, of which she was recently past president, she too has found it useful to team up with her cohorts in Generazione Vulture. Aglianico is known as a big, tannic, high-acid red that can require time in the cellar before it's ready to drink. The variety is also famously grown in Campania's Taurasi appellation, where other varieties can be added to comprise up to 15 percent of a blend. 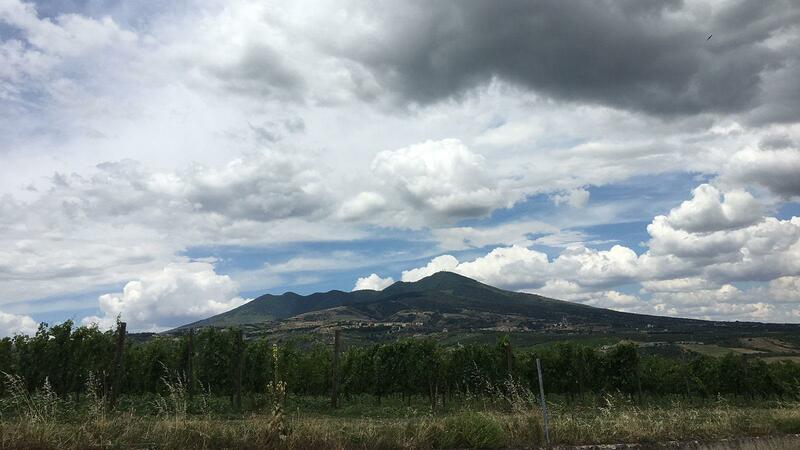 Aglianico del Vulture's volcanic soils and high altitudes, ranging up to about 2,000 feet, contribute to creating fresh, mineral-driven, spicy wines—qualities the new generation is seeking to highlight with gentler winemaking. "It's like a new translation of Aglianico," says Paolo Latorraca, 34, whose family sold their grapes for decades before starting Madonna delle Grazie winery, in Venosa, in 2003. "We are all young and energetic, and [the group] is a way for us to share experience and grow." Aglianico del Vulture is a sprawling appellation with rolling hills made up of varying strata of lava, volcanic ash, clay, limestone and river sediments. For years, Vulture has been spoken of as Italy's "next" star terroir. Andrea (left) and Lorenzo Piccin of Grifalco make a few different bottlings of Aglianico, from an everyday red to a single-vineyard wine meant for cellaring. "It's 20 years that Aglianico del Vulture has been about to become the Langhe of the south, or the next Tuscany," says Lorenzo Piccin, 30, whose family moved from Tuscany to start Grifalco in Maschito, which he runs with his younger brother, Andrea. (He also operates his own San Martino estate in nearby Forenza.) "But it never happens." Part of the problem, says Elisabetta Musto Carmelitano of Musto Carmelitano in Maschito, is the quiet conservative nature of Basilicata. "We are not big communicators here," she says with a laugh. Vulture's new wave of producers doesn't adhere to any one line of winemaking or viticulture—other than avoiding the highly extracted, oaky reds of the past. Most, but not all, farm organically. Some ferment with indigenous yeasts and others with selected yeasts. Some use Bordeaux barriques and others only larger casks. Some make only reds, while others make rosé and white wines (including whites from early-harvested Aglianico). Most have produced at least one wine that scored 90 points or higher in Wine Spectator blind tastings. Along with three 100 percent Aglianico reds, Luca Carbone produces an Aglianico rosé and a white from Fiano. "It's not easy in fact to live or work here," says Luca Carbone, 40, of Carbone Vini in Melfi, who says the group has helped fill a void. "There is not the exchange and competition that you have in Barolo or Montalcino. Without that contact and competition, it's hard to grow." Generazione Vulture has no official structure or leader, and it receives no outside funding. Group members regularly organize tastings at wine fairs, wear group T-shirts, and promote their efforts on social media. When they are not working, they often hang out together, drinking eclectic wines from other regions, as well as artisanal beers or trendy gin and tonics. "We are together for fun and to communicate in a light way about a product that is normally seen as a heavy wine in a lost region of Italy," says Viviani Malafarina, 43, a Genoa native who runs Basilisco winery in Barile, which Campania's Feudi San Gregorio bought in 2011. "We were discussing if we wanted to create an association. And we decided we didn't want to formally be anything. We travel together, we share expenses, and we have fun doing it." Hi Robert - how would you compare and contrast Edna (which is a current darling in the wine world) with Basilicata in terms of drawing attention to itself? Is there more capital flow into Edna which would explain its jump in publicity? Dear Thomas: Every wine scene is different. To have one requires a terroir, the right mix of people dedicated to expressing it, and also investment. The second part-- the people-- are critical, and Etna had a confluence of the right producers from different places in the early 00's. It has snowballed fro there. Vulture hasn't yet gained the same traction but is gaining steam with this group. Finally, what is also important is having the right --distinctive-- wine for the times. Nerello Mascalese on Etna is a light, elegant style naturally...Vulture wines also can be gorgeous in their own way. It will be interesting to see how all this evolves.